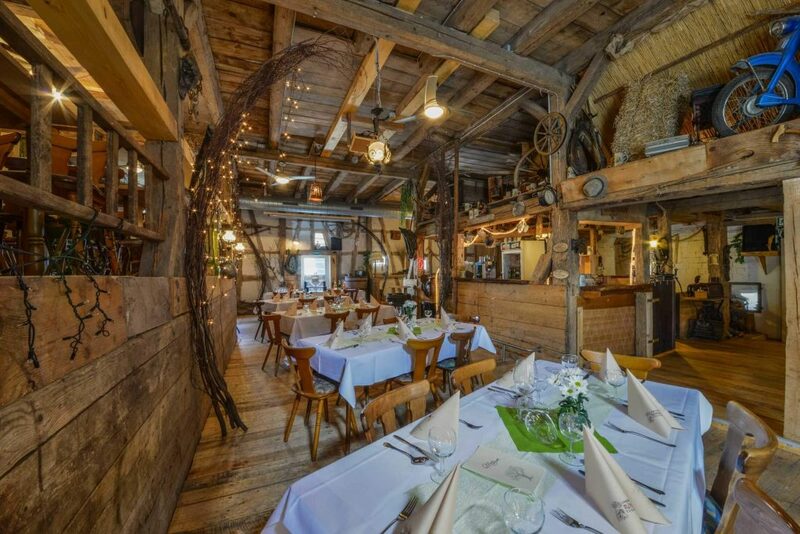 The rustic atmosphere at the Hörners Landgasthof provides the perfect setting for a great celebration. There is enough space for your family and all your friends. In addition, you can enjoy the comfortable atmosphere and the innovative decoration. Lay back and let our friendly staff take care of everything while you are having a good time. Depending on the size of your party, we recommend the restaurant, the broom closet, or our pirate room – in the summer our lovely beer garden and the spacious, fully equipped barn are also great options. We will also gladly assist you in organizing suitable entertainment and we can customize your menu and list of beverages according to the occasion. Weddings, birthdays or other celebrations – we are fully prepared to take care of everything your guests may need. 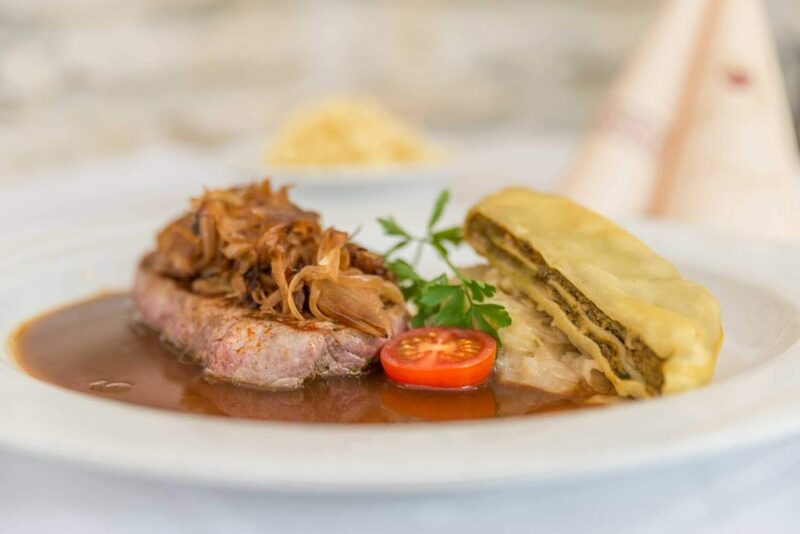 We are prepared to assist you with your celebration in many other places and we can find a barbecue location or organize a room in the Gemeinschaftshaus Türkheim or a hall in the Festhalle Nellingen. 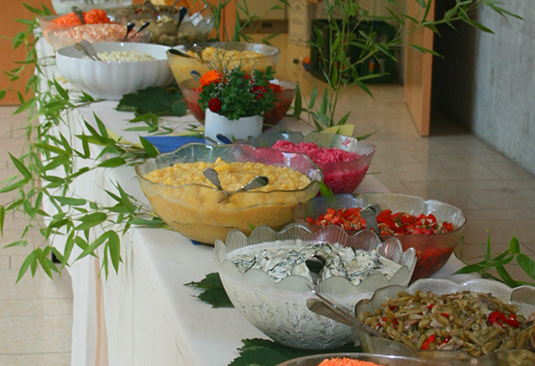 We will also gladly supply the food for your party at your home or premises! It all began in 2007 when the lady of the house turned 30 and we went on a surprise vacation. This trip was not only very relaxing, our short stay in the Tannheim valley also had an important side effect. 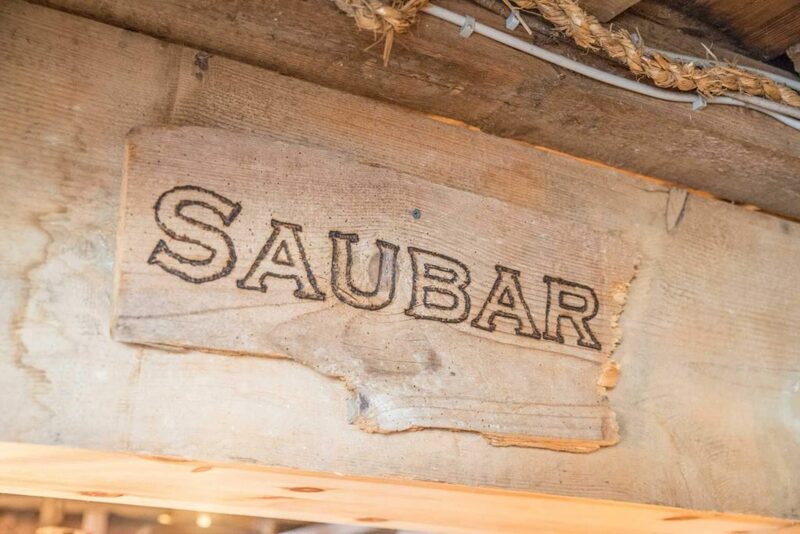 Inspired by the traditional inns of the valley, the young lady thought to herself: “We could do the same with our barn!” – so with the help of many great people, the barn was incrementally turned into a real barn restaurant. After building a model and getting the unavoidable cleaning action done, the final planning phase could begin. Before, the barn had still been inhabited by our farm animals. Unfortunately, the financial crisis set an end to the barn project and the construction work was paused – but this would not be the end of our story. 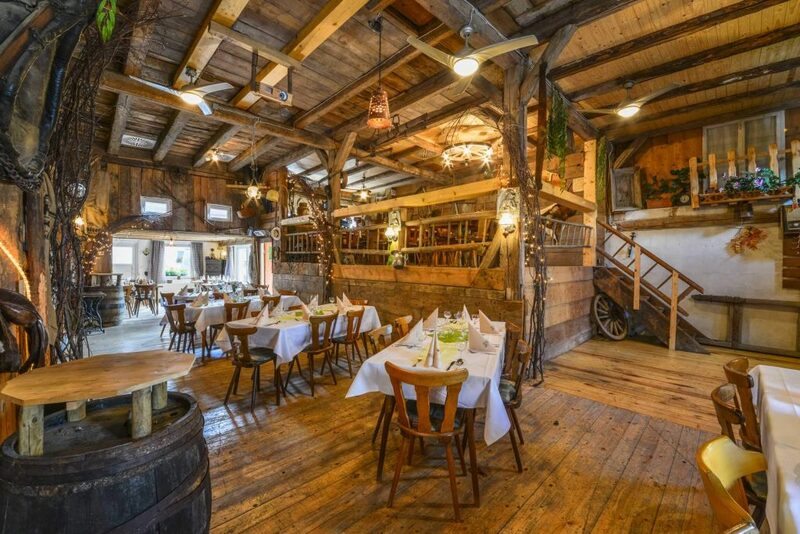 The concept of a barn restaurant was thrown overboard and replaced by the idea of an event hall with a stage. The animals were relocated and after renovating some walls and some improvements of the ceiling, the floor covering was finally renewed and everything was thoroughly cleaned until no farm smell remained. We have to thank Mr. Giel from Türkheim for 90% of the barn’s decoration. The last part of our project was the stage. Soon the party barn would become the venue of our first barn party. But it became clear after the party on New Year’s Eve that we needed to enlarge the barn. In March 2010, we started renovating the other part of the barn. Concreting, constructing a new ceiling, installing pipelines, building a real bar – it was a whole lot of work. We plastered, sanded, sawed and hammered to exhaustion. But with excellent planning, quite a lot of sweat, and even more dedication, we got closer to our goal. What was still missing??? …the Music! Thanks to our new official master of sound, Markus Aigner, the horridly bad and small stereo had vanished from our barn. When we sat in our “drinking stable” after our work was finally complete, we realized that a whole lot of stubbornness and a slight tendency to get a little crazy are sometimes necessary to reach your goal. With a lot of vigor, we continued to do more renovation work within the same year. Instead of having to cross the yard, men and women alike could now use two fun toilets directly within the barn. Again, the barn became a construction site and material store for a short period of time. But it was as early as September 2010 that our esteemed Winfried Wagner could already perform in our barn. In late 2010, we built our “VIP area”. The New Year’s Eve celebration 2010/2011 was outright historic and a night not to be forgotten. It was already 11 AM on the first morning of the new year, when we finally stopped the music. Barn fun number three – on 9 July 2011, we relaunched our legendary barn event! All guests were served little specialties from the buffet and Moert & Frank really got the party started. Frank hit the nail on the head when he asked what new additions he would find next year – Marc already knew what was to come next. In addition to the buffet room, we built a small kitchen for washing the dishes in order to not have to carry the dishes all the way to the other building. The project never stops! In 2012, about 20 new seats were added. The room next to the barn was divided into half and the two walls were removed from the barn to construct a gallery. Completion planned for: Before New Year’s Eve! We did it! We managed to finish both the gallery and the floor covering before New Year’s. A new emergency exit was also installed, since we didn’t like the look of the old one. A small ante room to keep off the wind off was finished within two days before the snow came and work had to be put to a hold for the cold season. The weight of the snow damaged a section of the roof, which had to be fully renewed as a consequence. This, however, did not keep us from partying! Additional insulation is added to the ceilings and walls for the barn to be best suited for the winter. A new exterior insulation to the neighboring house offers the half-timbered house additional protection against the cold weather. In addition, the entrance was redecorated. Plans for a kind of solarium as an entry area emerged and we hoped for the weather god’s and the carpenter’s cooperation. This time we had a specialized company do the work. An air heating system was installed to make the barn even more comfortable. The solarium was postponed for a little while. Lighting was optimized and the buffet room got an additional entrance. The old heating room was removed. In 2014, construction work and major modernization projects were either completed or, let’s say, postponed. 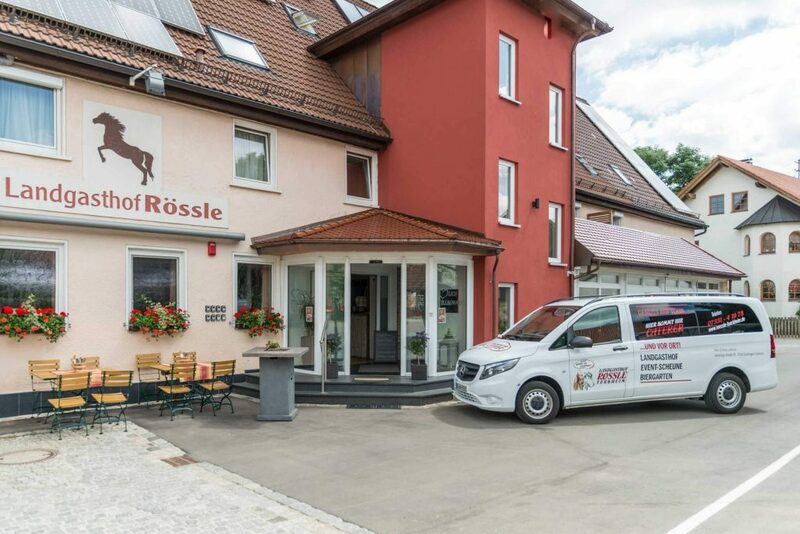 Instead of adding another large annex to the barn, the main building of the Gasthof Zum Rössle received a new staircase and a beautiful new dining room. The barn is still improved and enlarged as much as possible. Well, that’s just who we are! 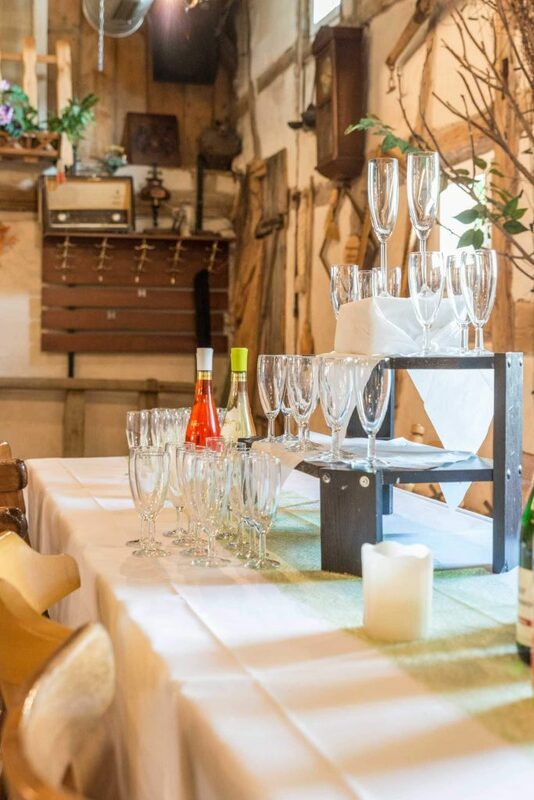 With the modern air heating, great lighting and a projector, the barn is a real experience and the events there never fail to impress our guests. From mid-November, the barn gets a holiday decoration that gives it a great Christmas atmosphere. Why don’t you come by for the “Familienschmaus”, our family-friendly event here at the Rössle.